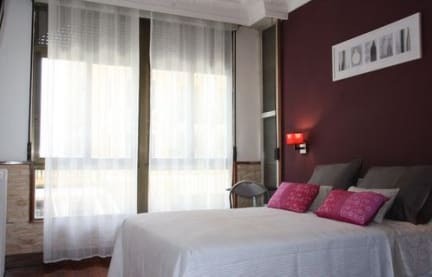 Pension Aia i San Sebastian, Spania: Bestill nå! Located within a 2 minute walk to Zurriola surf beach and Kursal conference centre. The town center with its many shops and the Old Town with its many bars and bustling night life are just a five minute walk away. The perfect place to stay and enjoy the best the city has to offer. Pension Aia with registration number HSS00713 and its friendly staff offer Twin Rooms with shower and wash basin and Double Rooms without shower. Two fully equipped bathrooms; one of them Disability Accessible, and a Disability Accessible Room. A Kitchen for self-catering, Wireless High Speed Internet Access in All Guest Rooms (Complimentary), Flat Screen Television, Towels and Linen. If you arrive earlier, we will be happy to keep your bags until your room is ready. Excellent stay, host Pablo is a gentleman!